Barbara La Valleur, a native of Ashby and Battle Lake, Minn., is an international photojournalist of more than 50 years. She was the first person to major in Mass Communications at the Minnesota State University Moorhead (formerly Moorhead State College), working her way through college as a cub reporter at The Forum of Fargo-Moorhead. She went on to work as the editor (and as it turns out the only staffer) of Carib, a weekly newspaper in the U.S. Virgin Islands. Next came a stint as Chief Photographer of the Daily News in Wahpeton-Breckenridge. After moving to England where she married and had two daughters, her family moved to Germany, staying over 18 years. After being a stay-at-home Mum for 10 years, she freelanced full-time for seven German newspapers, returning to the U.S. in the early 1990s. Since then, her photographs have appeared in The Forum, Women’s Press, Star Tribune, Sun Current, Edina Patch and as cover features for an international nursing magazine. She her husband, Arnie Bigbee, have three grandchildren, and reside in Edina, Minn. Barbara was honored with the Mayor’s Volunteer Service Award for her years as Public Art Edina Chair in 2017. She was also was recognized for six years on the Edina Arts and Culture Commission. Barbara and Arnie love spending time at La Farm, a family farm near Ashby, Minn., which she owns with her daughter. She has edited three books and self-published 17 photo books with two more in the works. A prolific exhibitor, she had a successful photo exhibit, “Love of a Lifetime: 50 Years of Photos in the U.S. and Europe,” in Edina and the Evansville Art Center in 2015. A photo exhibit, “25 Black & White Photos of European Women in Traditional Male Professions & Trades,” had a four-month run at the Germanic-American Institute in St. Paul at the end of 2016. 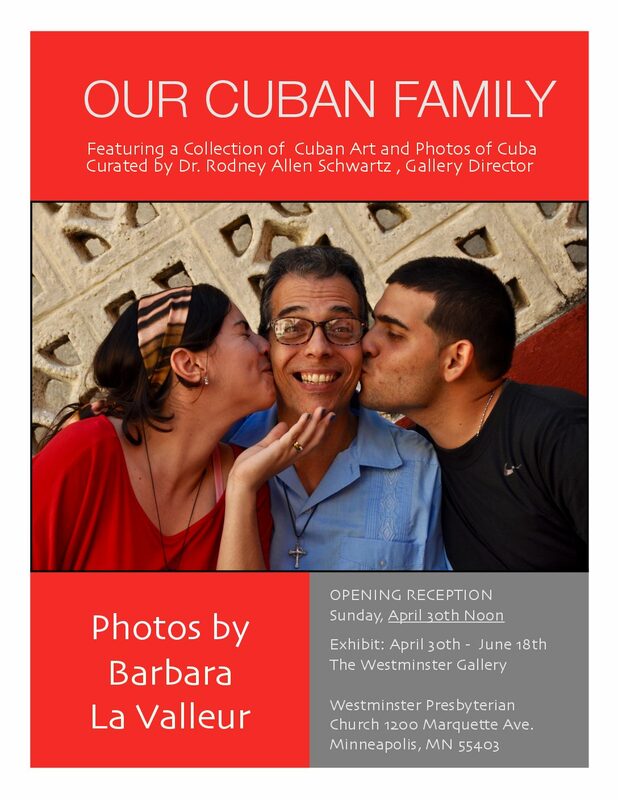 During 2017, she had three photo exhibits highlighting some of the 5,000 photos she took on a recent trip to Cuba: at The Westminster Gallery in Minneapolis; “Hola, Cuba!” at the Kaddatz Galleries in Fergus Falls and the Evansville Art Center. “Hola, Cuba!” moves to the Edina Art Center in January 2018 for her first solo exhibit there. Also scheduled in 2018 are “Love of a Lifetime: 50+ Years of Photojournalism” at the Red Door Gallery in Wahpeton, N.D., June through August, and her European women photos will be exhibited October through January 2019 at the Pearson Lakes Art Center in Lake Okoboji, Iowa. LA VALLEUR COMMUNICATES: Musings by Barbara La Valleur — A €62 Bowl Of Soup! LA VALLEUR COMMUNICATES: Musings by Barbara La Valleur — What The Cluck? LA VALLEUR COMMUNICATES: Musings by Barbara La Valleur — 500: One Day At A Time! Edina, Minn., photographer Barbara La Valleur and her husband, Arnie Bigbee, spend a lot of time at her family’s farm, appropriately named La Farm, near Ashby, Minn. A recent foggy morning provided her with this amazing photo op. LA VALLEUR COMMUNICATES: Musings By Barbara La Valleur — Hola, Cuba! LA VALLEUR COMMUNICATES: Musings By Barbara La Valleur — ‘Bye Gracie, Hi, Blu Pearl! LA VALLEUR COMMUNICATES: Musings By Barbara La Valleur — The Eye’s Have It! LA VALLEUR COMMUNICATES: Musings By Barbara La Valleur — Soup’s On!